The first Model 92 P.S. Bartletts listed in the Gray Book are found in 12018501-12019000 a run of open face movements and 12034001-12034500 a run of hunting case movements. There have been two P.S.B.s reported previous to these runs. Those numbers are 10030075 and 10030194, seen in the photo to the right. They come from run 10030001-200 which the Gray Book lists as a run of Specials. To date one other movement has been reported from this run, 10030015 which is a Waltham Railway Timekeeper movement. 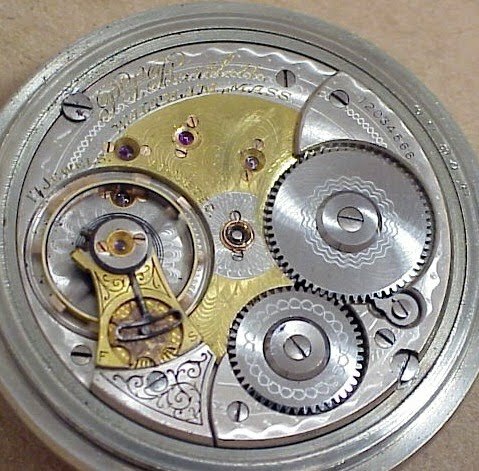 I have seen one other SNP2 PSB movement which was in an auction at a well known horological auction house. I made every effort to buy it but failed and then attempted to get the serial number but did not succeed at that either. I operate under the assumption that there were 150 of these made. These movements are the first Bartletts listed in the Gray Book. They occur with the Patented Stud, the Balance Jewel Screws in the east/west orientation and the case screws in the BET position. PSB3 movements have the Case Screws located in the EDGE position. PSB4 movements are found with the 08 Regulator and the Split Click. There are 2 runs listed after 170195000 in the Gray Book. They are 19061001-19061050 a run of hunters and 19061051-19061100 a run of open face movements. To date, no movements have been reported from these runs. Photos show that some movements in the 17 million range have the The Groove and some do not.